Winter is the perfect time to enjoy tasty stews. However, by now you may be getting a tiny bit tired of heavy, gravy rich meat and poultry stews. The Moroccan tagine, with it's fresh, sunny flavours and spices, is perfectly hearty but not a bit heavy. Served over brown rice, and topped with a dollop of Greek yogurt or sour cream, you'll almost forget all about the snow! I discovered this recipe years ago on the President's Choice website (You can find the original President's Choice recipe here. My how-to follows their recipe fairly faithfully, with just a few changes. If you need more detailed cooking instructions, be sure to hop over to their recipe.) 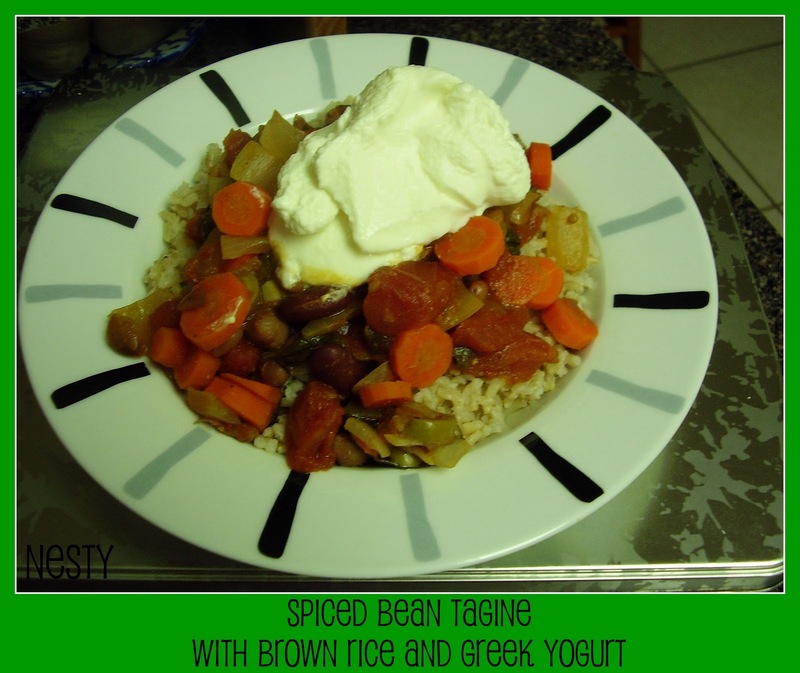 Over the years I've made adjustments, and in our house we fell into the habit of serving it over brown rice and topping it with a dollop of sour cream, or, more recently, Greek yogurt. It's the perfect recipe to jump start a clean eating campaign; it's so hearty that you don't feel deprived, and the amazing combination of lemon, olives, veggies and spice makes it feel like a real treat! I also love how fast and easy this dish is to prepare, yet it sounds, looks, and tastes totally exotic. If you're hosting a dinner party and need a meat-free entree, look no further than this terrific tagine! 4. Add the carrots and cook until the carrots are almost tender. 5. Add the tomatoes, with juice, and the beans. 6. Bring the tagine to a boil, then reduce the heat and simmer for 5 minutes, until it starts to slightly thicken up. 7. Add the spinach and stir until it's wilted. Serve over brown rice (or grain of your choice) and top with a dollop of Greek yogurt or sour cream.